Welcome to our Healthy Beauty by Lana blog. I am excited to share all of the tips and tricks that make beautiful skin on the outside and healthy guts on the inside! First, beautiful skin really starts on the inside, Think about it, your skin is the biggest organ in your body! Your body’s health status, inflammation, intestinal fortitude, good and bad bacteria, vitamin and nutrient deficiencies and so on are often reflected in your skin health. For example, a sensitivity to dairy will show in an ongoing acne problem on the face, back and shoulders. However, the funny thing is that we often don’t see it that way. Sensitivities in our body, like acne, tummy bloating, perhaps excess flatulence, sore joints so on, we often attribute to age, sleeping in odd positions, eating too much chocolate. While some of those symptoms could exaggerate a problem, often issues can be solved with healthier , eating habits. Try a simple test. For one week, remove all gluten from your diet. It really isn’t that hard. Fill half your plate with greens like kale, broccoli, squash, and spinach then fill the other half with good cards eg sweet potatoes, healthy protein like wild caught salmon and raw almonds. You never know what will happen by the end of the week. Are you feeling a little run down? Perhaps, suffering from adult acne? Join me in my Clean Eating Challenge: 30 Days to Healthy Living and Beyond. 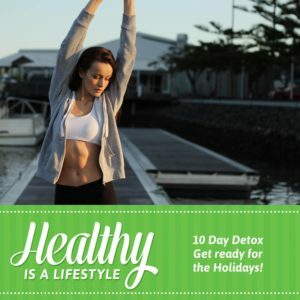 During the December months, we are doing a more simple 10 Days detox before the Holiday Festivities. Join me. This information is not intended as medical advice. For any health questions please connect with your Doctor, Lana Burnley is a Certified Makeup Artist, student of Healthy Nutrition and 3x Breast Cancer survivor.